The East End Chamber of Commerce Foundation is committed to serving the educational and communal needs of Houston's East End by partnering with public officials, Chamber Members, and the community to offer workforce development, monetary support and guidance to local students. The Foundation helps Chamber members and non-members become more involved with the East End community. Each year the Foundation selects a handful of initiatives, programs and/or partnerships to advocate. The East End Scholars mission is committed to serving the educational and communal needs of Houston’s East End by partnering with public officials, Chamber members, and the community to offer workforce development, monetary support and guidance to local students. Founded in 2006, The Foundation is committed to supporting the educational needs of area students and has awarded over $320,000 in scholarships the last 11 years. Students receive recognition at our Annual Education Symposium where we strive to bridge industry and education by building an effective workforce. After receiving their scholarships, students are placed in our mentorship program where they are partnered with industry professionals from our community. The Mentor Program is designed to help our students succeed in school and in their careers. If you're interested in becoming a mentor or contributing to the scholarship fund, let us know. Or, contact us if you are interested in having your school participate in the program. In 2013 the Chamber began dialogue to create a bridge between industry and education in order to create a workforce that meets the needs of businesses. The great work continues annually through this event! Attendees continue to discuss partnership models that are effective. Participants are also taking a look at the current changes in schools, discussing how industry can provide effective feedback, and calling for action. 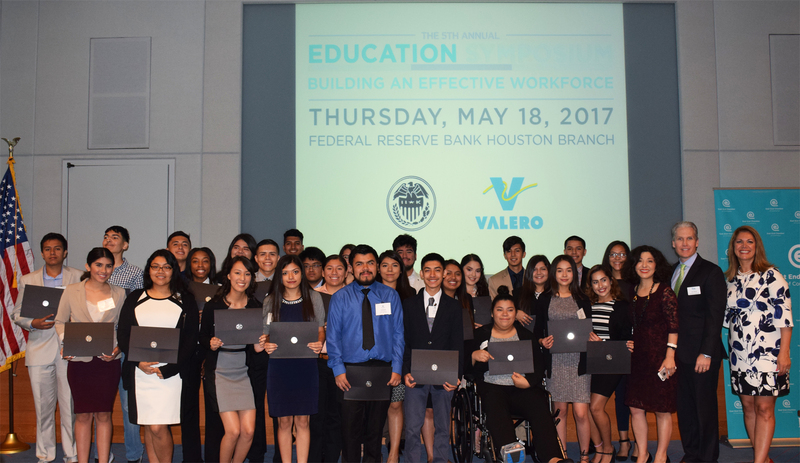 The Foundation and it’s supporters are committed to serving the educational and communal needs of Houston’s East End by partnering with public officials, Chamber members, and the community to offer workforce development, monetary support and guidance to local students. Your investment in the Foundation will ensure that programs such as My East End Career Path, The Annual Education Symposium and the East End Scholars program are continuously made available to students throughout the East End. Support East End Scholars Mentor/Mentee Program including the send-off & Winter lunch & learns (tips to succeed in college). For more information contact us at chamber@eecoc.org or 713-926-3305. Success in education not only guarantees a future for students but the positive growth of business and community. To continue our support of education in Houston's East End we depend on valuable donations from people like you. Make a tax-deductible donation today and become a proud supporter of Houston's success.